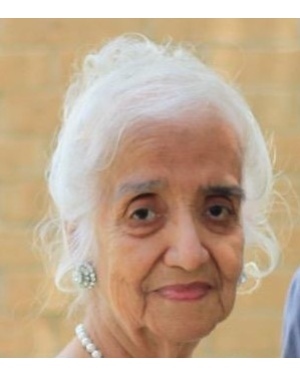 Lilia F. Ybanez, 81, entered eternal rest on February 7, 2019 in San Antonio, TX. She was born to Miguel G. Flores and Petra Fuentes Flores in Laredo, Texas on April 14, 1937. She is preceded in death by her parents, Miguel & Petra Flores and her brothers, Miguel Jr., Manuel, Raul and Martin. Lilia is survived by her loving husband of 62 years, Manuel S. Ybanez, Sr.; Sisters, Socorro Flores and Petra F. Marcha; Children and in laws, Manuel Ybanez, Jr. (Yvette) of San Antonio, David F. Ybanez (Lupie) of San Antonio, Pete F. Ybanez (Paula) of Edinburg, Grace Ybanez Kresch of San Antonio; 10 Grandchildren and 17 Great-Grandchildren. The marriage of 62 years began when a young Marine sent a letter to a young beautiful Roy Miller student who soon thereafter developed into a pen pals. Upon coming home, from the Korean War, she became his bride. She retired from Southwestern Bell as a telephone operator, was a devoted Catholic of St. Joseph Catholic Church. She enjoyed being around her grandchildren and great-grandchildren. Her beautiful smile and soothing voice will be forever be missed. A visitation from 3pm – 9pm on Tuesday, February 12, 2019 at Corpus Christi Funeral Home, 2409 Baldwin, with a Rosary to be recited at 7pm. A Funeral Mass will be celebrated at 10am on Wednesday, February 13, 2019 at St. Joseph Catholic Church. Interment will follow at Rose Hill Cemetery. Having the distinguished honor to serve as pallbearers will be her sons and grandsons.